Product prices and availability are accurate as of 2019-04-20 22:23:59 EDT and are subject to change. Any price and availability information displayed on http://www.amazon.com/ at the time of purchase will apply to the purchase of this product. 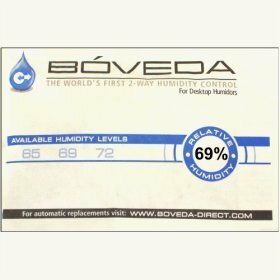 Boveda's 2-way humidity control is the only technology that can be pre-formulated to a specific humidity level with an accuracy of +/-2%. Boveda guarantees a constant level of humidity that never fluctuates or cycles. It also eliminates bacteria, mold or mildew. You will never have to use distilled water or PG solution again. Use one packet for every 50 cigars your humidor can hold, plus one additional packet (for example, 2 packets for a 50 cigar humidor, 3 packets for a 100 cigar humidor). Each set will last 3 months in most humidors.